Buy The Eco Bath Plain Epsom Salt Bath Soak - 1000g in the UK from our online shop or directly from our independent Scottish store. This epsom salt bath soak has a unique blend of epsom salts to bring you the ultimate in bath time relaxation. Plain and simple, no fragrances added! This derma epsom salt bath soak has a unique blend of epsom salts to bring you the ultimate in bath time relaxation. Epsom salts (Magnesium Sulfate), plain and simple! We sell real The Eco Bath and other Bath & Shower directly from our shop in Scotland and online throughout the UK. View more products from The Eco Bath. Where can you buy real Epsom Salt Bath Soap Plain 1kg safely online? 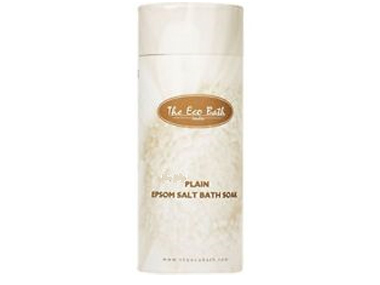 If you are wondering where you can buy The Eco Bath Plain Epsom Salt Bath Soak - 1000g safely online in the UK, then shop with us. We are an actual health foods shop; with real people selling real foods and products. Our award-winning independent shop is located in Stirling, Scotland since 1976. You can buy our Bath & Shower in store or safely place an order with us online or over the phone. Epsom Salt Bath Soap Plain 1kg - The Eco Bath Plain Epsom Salt Bath Soak - 1000g in Bath & Shower and Personal Care.